Jason Barr is associate professor of economics at Rutgers University, Newark. He will be presenting a paper entitled "Skyscraper Height and the Business Cycle" at the 2013 Annual Meeting of the American Historical Association in New Orleans, Louisiana on Thursday, January 3. “Does Skyscraper Boom Herald Economic Doom?” Yes, according to the Skyscraper Index. In the words of its creator, Andrew Lawrence research director at investment bank Dresdner Kleinwort Wasserstein, the Index shows that “an unhealthy correlation exists between the building of world’s next tallest building and an impending financial crisis.” But is this true? There's a common (mis)conception that skyscrapers are inherently uneconomic, that by virtue of their gigantism, they are monuments and not moneymakers. The popular press helps feed this idea by quoting builders with outsized egos. In 1910, for example, F.W. Woolworth told the New York Times about his eponymous tower, “I do not want a mere building ... I want something that will be an ornament to the city.” Nearly a century later, Donald Trump told the same outlet, “I've always thought that New York should have the tallest building in the world. ... It doesn't. But now, it has the tallest and most luxurious residential building in the world.” Thus, we have come to believe that developers are like zombies, mustering at the gates of banks, moaning, “Loans, loans, loans!”; and as soon as the banks open the spigots, the quest for supertalls and height competition will be unleashed on the planet, demand be damned. But first must come profits, since without them these monoliths cannot stand. Developers generally build tall as a rational response to expensive land values. The higher the cost of land, the taller they must build in order to secure a reasonable return on their investment. But land values are determined by the value to society of a particular location. Thus, building height is a response to the needs and wants of consumers. This desire to share a square of dirt is driven fundamentally by what people can do on that spot and how easy it is to get to it. If a piece of land is near a railroad station, then people will want to go there since it reduces their commuting times. But once there together, it turns out they are more productive. They learn from each other, meet clients, and catch up on important news. By imposing density on the urban landscape, the skyscraper is an efficient means by which people can be together, and they are willing to pay for it. This economic demand creates an optimal height: one where, at that height, the cost of providing the last or tallest floor just equals the rent that tenants are willing to pay. My research has found that the vast majority of skyscrapers are economically rational -- the greater the demand, the greater the height. Nonetheless, I have also found that some buildings are, in fact, economically too tall. But the key thing to remember is that without the underlying economic rational, supertalls could not exist. In other words, economics get must get us so high in the first place, and then there’s room left over for advertising and ego displays. This is especially true of the world’s tallest buildings, which we naturally assume were born from our irrational instincts. But if we look at the context in which these buildings take place we see a similar theme: growing cities within growing economies. Height competition began in earnest with the first skyscrapers in the late 1880s, when New York and Chicago both implemented steel-skeletal construction. 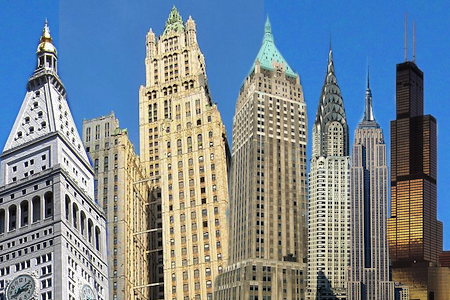 Since 1890, there have been four distinct generations of record breakers, and fourteen skyscrapers have held the title. In the first generation, six buildings were completed, all in New York: the Pulitzer (1890), Manhattan Life Insurance (1894), Park Row (1899), Singer (1908), Metropolitan Life Tower (1909), and Woolworth (1913). They emerged when the population of the island was bursting at the seams, and the city was cementing its place as an economic powerhouse. Five of them were built as corporate headquarters, and each company was in an industry that was part and parcel of America’s development and progress. The second generation saw the Bank of Manhattan (1930), Chrysler (1930) and Empire State (1931). These three buildings have drawn the most attention because they were the result of a height-race triangle. Chysler famously waited until the Bank of Manhattan Building topped out, before having his architect erect the building’s stainless steel spire. One of the developers of the Empire State, Jacob Raskob, was a former General Motors executive, who was eager to beat out rival car maker Chrysler. As with the first generation, these buildings were built in the context of rapid economic growth, and urbanization. Notice who built them: one was a bank and two were newly rich from the growth of the automobile industry. They were constructed upon the heels of World War I, when New York was becoming the undisputed financial and commercial capital of the world. The third generation saw the completion of the Twin Towers of the World Trade Center in New York (1972/73) and the Sears (now Willis) Tower in Chicago (1974). The Twin Towers were built as part of a larger planned city-within-a city in lower Manhattan. The goal was the revitalization of an aging, but still important, downtown. The Twin Towers project, interestingly, appears to be the only one of the entire bunch that was built to combat stagnation. It was the first project to introduce government into the record-breaking game. The Sears Tower, on the other hand, was constructed to house Sears, Roebuck & Co., at the time, the world’s largest retailer. The company had projected that centralizing its staff would cause it to need two million square feet of space. The current generation, though all located in Asia, share similar circumstances as the previous generations. Each of the buildings -- the Petronas Towers (Kuala Lumpur, 1998), Taipei 101 (Taipei, 2004), and the Burj Khalifa (Dubai, 2010) -- have been constructed in growing cities, within rapidly-growing nations. These Asian cities have used their buildings, in part, to act as real estate debutantes -- to announce to the world they are modern societies open for business in the global marketplace. They advertise themselves to be the new New Yorks and Chicagos of the world. The Skyscraper Index, however, implies that we can predict a crisis by looking at supertall construction, since easy credit unleashes the egos of developers. To test this, I have measured the length of time between both the announcement and completion dates of record breakers and changes in the business cycle. There is virtually no relationship between them. I, along with my coauthors, performed a more rigorous statistical analysis to see if we could predict a recession in four locations (United States, Canada, mainland China, and Hong Kong) by using the height of the tallest building completed each year, and we could not. The problem with the Skyscraper Index is that it is falsely seductive. We want to believe it to be true because it plays into our perception that height is simply driven by the impulse to go big. The Index is an example of post-hoc reasoning: once we see a record breaker, we look around for a crisis to pair it with. According to the National Bureau of Economic Research, in the United States since 1890, there have been 26 recessions or depressions which have occurred, on average, every 3.5 years. There have only been fourteen height record breaks in that time. So it’s easy to find a crisis and pair it with a record breaker, since downturns have been twice as likely new titleholders. Between 1890 and 2010, the American economy grew by a factor of forty-one, while the world’s tallest building grew by a factor of nine. Rather than asking why are skyscrapers too tall, perhaps we should be asking, why aren’t they taller? This is not to say that builders don’t sometimes get carried away or make mistakes. But rather, we need to be careful about the underlying assumptions we make regarding the purpose of the skyscraper. Its objective is primarily to bring us together and protect us from the brutal forces of Mother Nature. While races to the sky may be exciting to watch, they are just a sideshow in our quest for a better life.